War is never a pleasant phenomenon to contemplate, and the idea of children participating in a war is deeply disturbing, yet many Soviet children laid down their lives for their country in the Great Patriotic War (WWII). RBTH tells the story of five of these young heroes, who passed into Soviet folklore, and whose tales were used to inspire patriotism in a new generation of Soviet children. War is never a pleasant phenomenon to contemplate, and the idea of children participating in a war is deeply disturbing. However, Russian history has preserved many examples of the heroism and sacrifice of young fighters who laid down their lives in the battle to liberate their country from foreign invaders. The editorial staff of RBTH have chosen five child heroes of the Great Patriotic War (WWII) who were under 15 at the time of their deaths.Although many of the details of these stories are impossible to verify, these children passed into Soviet folklore as heroes, and their tales were used in schools to inspire patriotism in a new generation of Soviet children. 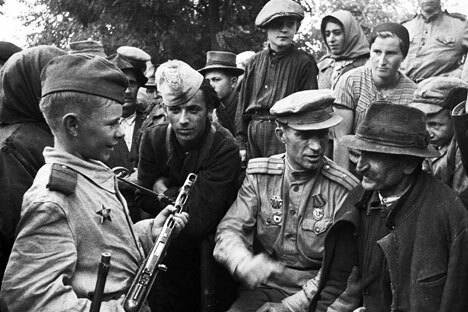 Partisan scout and the Youngest Hero of the Soviet Union. Partisan scout and the Youngest Hero of the Soviet Union. Valya Kotik worked on collecting weapons and ammunition, and painted and pasted placards with caricatures of Nazis. In the fall of 1941, he carried out ​​a real diversion – he set up an ambush near a road, and with a grenade, he blew up a car carrying Nazis, killing several soldiers and the squad commander of the field gendarmerie. From 1942, he participated in the partisan movement in Ukraine – he derailed trains and blew up warehouses. He died in 1944, at age of 14, in the battle for the city of Izyaslav. His father, a sailor in the Baltic Fleet, called him Marat, in honor of the battleship Marat. After the death of their parents, he and his sister became fighters in a partisan unit. Kazei successfully penetrated enemy garrisons in villages on many occasions, obtaining valuable information for scouts. He organized dozens of explosions on railway lines and participated in battles. In 1944, in the village of Khoromitskie (Belarus), the partisan scouts were discovered by the Nazis. The Germans surrounded the boy, hoping to grab the scout alive. Marat shot back at the Germans, and when he ran out of ammunition, he blew himself up with a grenade. He was 14 years old. In the early summer of 1941, during her summer vacation, this Leningrad schoolgirl went to visit her grandmother in a village. After the war started, she found that she was unable to return home as the village she was living in had been captured by the Germans. In the summer of 1943, Lara and a friend ran away to join a partisan unit, where she became a scout. She collected information about the number of German soldiers, locations of gun emplacements, and participated in the “railway line” war, derailing enemy trains. In the fall of 1943, the 14-year-old girl was seized by the Nazis during a scouting expedition. During the interrogation, she tried to blow herself up with a grenade, which for some reason did not explode. After being severely tortured, she was shot by the Nazis. When the war started, the 13-year-old schoolboy took shelter with a group of partisans in a quarry in Kerch (a city in Crimea). Volodya was the messenger and scout in this underground fortress. For about two months, the invaders fought against the partisan group in the quarry, eventually cementing up all the exits. As Volodya was the smallest, he managed to get out to the surface through very narrow manholes, unnoticed by the enemy. In January 1942, Kerch was liberated by soldiers of the Red Army. Sappers began to de-mine the area around the quarry, and Volodya volunteered to help them – he was killed after stepping on a mine. The youngest hero and a violin prodigy. The only one of the five children that did not participate in the fighting and was never a partisan, his name has nonetheless become a symbol of courage for all child-heroes of the Great Patriotic War. In the summer of 1942, the boy’s family, being Jewish, were all arrested and sentenced to death. Together with others that were sentenced to death, they were taken to the Kuban River, where residents from the entire village were herded. Musya, holding a violin, started playing “the Internationale” – the anthem of the Communists, which at that time was also the anthem of the Soviet Union. The song was immediately picked up by the residents of the village, and according to the story, the 11-year-old boy kept playing until the bullets cut him down. Child heroes were positioned in Soviet mass culture as examples of courage and valor for the new generation of children, who did not know the horrors of war. Stories were written about Lara Mikheyenko and Volodya Dubinin, and at one time, these were even included in the school curriculum. Musya Pinkenzon became the hero of an animated film.